He would seat himself at the piano, drooping over the keys, and the old songs, his particular way of singing them in his sweet tenor voice, and the expression his face — these were things one can never forget. James Joyce the ... Musician? Singer ... pianist ... composer ... entertainer ... impresario — though he made his mark on the world as a brilliant writer, there was a part of Joyce that never strayed far from that "alternate" career he almost had as a musician. It is an aspect of his complex life that is most evident, ironically enough, in his writing, in which scholars have cataloged literally thousands of musical allusions — to singers, composers, instruments, musical venues and, of course, songs of various stripes — many of them integral to the understanding of his poems, stories, and novels. His books are saturated with the deep knowledge and affection for music with which he grew up and which stayed with him all his life. At that time I was just beginning to be interested in acoustic relationships, the relationship of a fundamental tone to its other partials. This too interested Joyce a great deal, particularly when I pointed out that the third partial of the note C was G and the fifth partial was E and that I saw no reason why polvtonal passages in which the music was played in C major, G major, and E major at the same time were not only logical but were rooted in natural relationships in the harmonic series. Joyce's actual experience with music was so different from his intellectualizing about counterpoint that he seemed to be two people. He had heard Hans Zimmerman, a student of mine and later director of the Zurich Opera, conduct a chamber orchestra for which I had arranged and performed a suite of Gluck's music, including the famous flute solo "Dance of the Departed Spirits" from Gluck's Orfeo ed Euridice. Afterwards, Joyce said that he considered this solo to be the greatest piece of music ever written. He began going through the piece, note by note and phrase by phrase, literally transposing it first into word inflections and then into verbal images. At the end of this evening with Jovce I had learned more about the relationship of language to music than ever before or since. 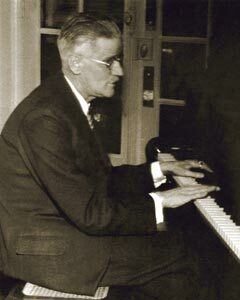 Joyce enjoyed giving literary interpretations of the contrapuntal techniques in music. This turned into a kind of intellectual exercise in which he professed to use the devices for his own purposes in his own medium. On June 18, 1919, he walked with George Borach around the Zurich See justifying his writing of "Sirens". He said, "I finished the 'Sirens' chapter during the last three days — a big job. I wrote this chapter with the technical resources of music. It is a fugue with all musical notations: piano, forte, rallentando, and so on. A quintet occurs in it too as in the "Meistersinger", my favorite Wagnerian opera. Since exploring the resources and artifices of music and employing them in this chapter, I haven't cared for music any more. I, the great friend of music, can no longer listen to it. I see through all the tricks and can't enjoy it any more."